Many women are turning to diamond alternatives when it comes to their fine jewelry, including wedding bands and engagement rings. Forever One Moissanite from Charles & Colvard is among the most popular diamond alternatives on the market. 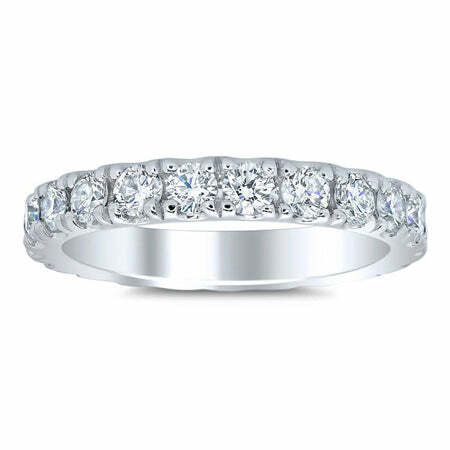 We carry a huge collection of Forever One Moissanite jewelry, including moissanite wedding rings. Our moissanite wedding band collection features many classic, timeless styles that can be worn and enjoyed for many years to come. Below are a few of my favorite moissanite wedding bands that are currently offered from deBebians. Five stone rings have always been a favorite for choice due to their traditional look. We offer both a standard shared prong setting as well as a u prong setting for this five stone ring. 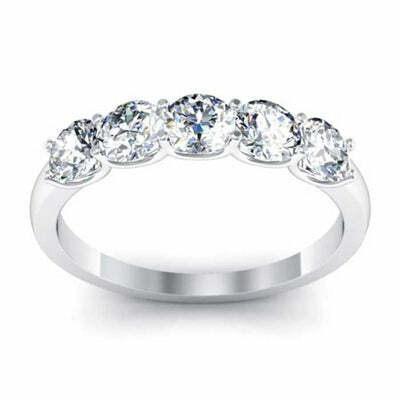 The ring features round brilliant cut Forever One Moissanite that will feature more fire and brilliance than diamonds. An eternity band features stones the entire way around the ring. This ring is set with pave set round brilliant cut moissanites in a u pave setting. The ring has a width of 3mm and is a favorite style to be worn as a wedding band or anniversary ring. 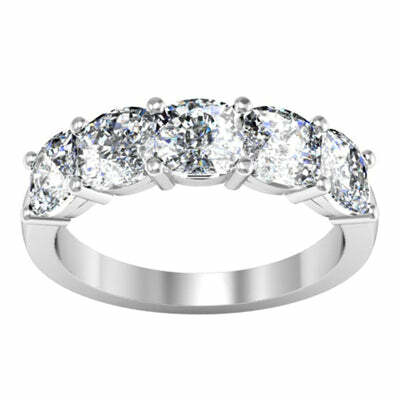 Cushion cut moissanite stones can be set into a shared prong or a u prong setting to create a stunning piece of jewelry. The ring has an impressive width of 4.5mm. We use Forever One Moissanite from Charles & Colvard, which are ethically created and full of fire and brilliance. Shop our entire collection of moissanite wedding bands to see additional rings that are currently available from deBebians.